Windows Live will no longer be supporting new custom domain sign ups. Existing users will continue to have access to their account with their domain email address but will be unable to add or remove accounts. Windows Live customers will be given the option to migrate to Office365. For more information, please see: Microsoft Ends Custom Domain Support For Outlook.com, Suggests Users For Office 365 Migration. If you wish to use Office365 for your email service, please visit these instructions. You'll need to follow the steps outlined under "Add a domain that you’re already using for email, switching the email to Office 365 and leaving your public website at your DNS hosting provider." You can also view this video tutorial. 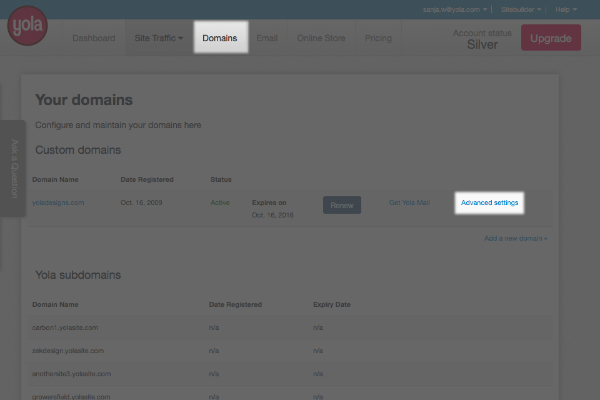 Log in to My Yola and click Domains. Click Advanced settings next to the domain you want to edit. You will be taken to a page with a list of options for that domain. If you experience any trouble, it is best to contact Office 365 for further assistance as we do not access to that email service. Here's a link to troubleshoot issues after changing your domain name or DNS records if your domain isn't working properly. You can also ask for additional help in the Office 365 Community. If you prefer to use Yola's email service, Yola Mail, please click on this link for more information: Setting up your email with Yola Mail. Please note: Yola Mail is not available to partner programs.